The first batch of temperature-controlled shipping containers containing yam tubers from Nigeria have been approved for export to the United States of America and the United Kingdom. Hurray! According to Dashiell who delivered a goodwill message on behalf of IITA Director General Nteranya Sanginga, the yam export event marked a major milestone in Nigeria as IITA turns 50 years in 2017; it demonstrates IITA’s commitment to transforming agriculture in Africa, ending hunger and poverty, and creating long-term solutions to the challenges of economic development. 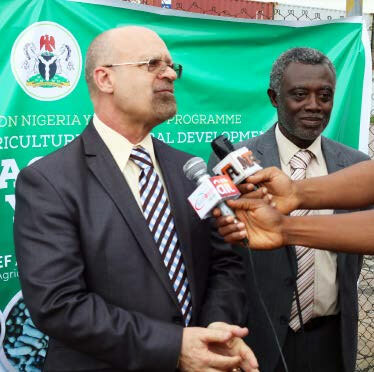 He emphasized the active role played by the AfricaYam and YIIFSWA projects in developing more productive and pest-resistant yam varieties to suit the needs of farmers and consumers in diverse agroecological zones as well as providing technologies for rapid multiplication in seed yam production. This hallmark event ushered a new dawn for yam farmers, processors, and stakeholders across the yam value chain in Nigeria who will benefit from increased market opportunities for their produce. This is expected to create job opportunities and contribute to the country’s economic development. Chief Ogbeh shared his vision for yam farmers in Nigeria and emphasized the Federal Ministry of Agriculture’s support to ensuring a zero-reject of agricultural produce exports from Nigeria. answering questions from the media. Chief Ogbeh addressed the concerns of stakeholders who expressed fears over the possibility of yam scarcity and high prices as a result of limited availability of yam in the domestic market. The minister affirmed that postharvest losses account for a significant part of yam wastage annually and export markets provide an opportunity to earn income for yam which would have been lost. He assured stakeholders that the government is working through the National Centre of Agricultural Mechanization (NCAM) to deliver mechanized solutions capable of making yam mounds and harvesting which will significantly reduce the costs of yam production. With the stage set for yam export, it is essential that certified clean seed yams are planted to maximize the earning potential of producers while also adopting recommended agronomic practices. Investments in mechanization, yam conditioning center, and refrigerated shipping containers among others will enhance the yam value chain. Asiedu also shared his expert thoughts on yam production in Nigeria with Channels TV. Watch video here (starts at 6:58).